Guwahati, Jun 10 : At least 18 tribal villagers in India's northeast were arrested for hacking to death a man they suspected of practising witchcraft, police said Saturday. 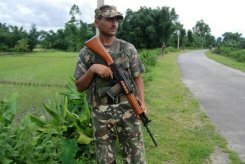 An Indian soldier patrols the road to Gorubakha village in Assam, on July 22, 2012. At least 18 tribal villagers in India's northeast were arrested for hacking to death a man they suspected of practising witchcraft, police said Saturday. They claimed they were told to kill the victim by a Hindu goddess who appeared in their dreams. Mobs have killed at least 200 people over the past five years who they have accused of practising sorcery and witchcraft -- mainly in tribal-dominated areas of western and northern Assam state, Indian police say. The killing took place on Friday at a tea estate village in Assam's Cachar district, 300 kilometres (180 miles) south of the impoverished state's main city of Guwahati. Cachar district police chief Diganta Bora told AFP by telephone that the attack was "barbaric with a group of hysterical villagers sacrificing the man by piercing his neck with sharp weapons and chanting religious hymns". The villagers who took part in the killing of the 55-year-old man believed the victim was practising witchcraft and were seeking to "appease the goddess Kali", the Hindu deity of destruction, Bora said. "Villagers said during police questioning the goddess told them in their dreams to kill this man to prevent disease and other ills from spreading into their village," Bora said. Superstitious beliefs, black magic and demonology are integral to tribal customs in parts of Assam, Tripura and other northeastern states, authorities say. "Most of the people were drunk and dancing with the dead body in front of them and later they buried him a pit," the police official said, adding the investigation into the death was still under way. "We will soon pick up some more people directly involved in this heinous crime that was inspired by superstitious beliefs," Bora said. Assam's police inspector general, Kula Saikia, called such killings "a really big problem" for authorities. "Most of these cases are inspired by superstition. It is shocking to hear about such incidents in this modern world," he said, adding that the victims are often killed "very brutally". Police in the state have set up a programme, called Project Prahari (Vigilance), that involves community policing and holding regular education campaigns among tribal chiefs and village elders. "Simply enforcing the law and punishing the guilty are inadequate measures. There has to be an attitudinal change," Saikia said.